This is a quick WordPress Installation guide with screen shots to get your blog up and running quickly. After reading this WordPress Installation guide you will know exactly how you can install WordPress quickly on your Blog in Four easy steps. A detailed WordPress Installation Instruction can be found at WordPress.org. I install WordPress frequently for my friends and myself and I find the detailed installation instructions on WordPress.org to contain too much details for me, so I needed a cut down and more common version of WordPress installation instructions and hence the birth of this post. This WordPress installation instruction mainly takes into account the most common web hosting solution example (e.g. access to ‘cPanel’). I install WordPress this way because it allows me to work on concurrent installation related tasks at the same time (e.g. Add database while the WrodPress files are being uploaded to my server) resulting in a reduced total WordPress install time. Download and unzip the latest WordPress package from WordPress Download Page. Upload the WordPress files (all the directories and files that is inside the extracted WordPress Directory) to the root directory (In most cases this will be the ‘public_html’ directory) of your web server or to a sub directory if you want to host your blog in a sub directory of your site. 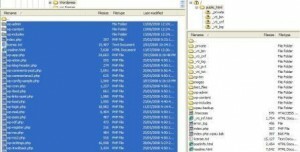 I use FillZilla (free ftp software) to upload my files but any ftp program can be used. Choose a user name (e.g. ‘user’) and enter it in the User name field. Choose a password for this user. Write down this password on a piece of paper or on a text file. Click on ‘Go Back’ to go to the MySQL Database Page Write down this user name and password on a piece of paper or on a text file. 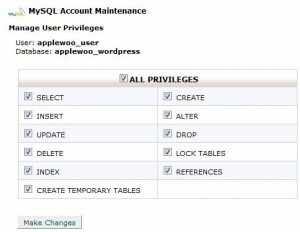 Create a database for WordPress from the Databases section. Enter a name for your WordPress database (e.g ‘wordpress’) and click ‘Create Database’. Click on ‘Go Back’ to go to the MySQL Database Page. Go to the ‘Add User To Database’ section on this page and select the Database and user name you just added from the drop down menu if not selected already. Select “ALL PRIVILEGES” and click ‘Make Changes’. Note down the WordPress Database and user name that you just created from this (MySQL Database) page. 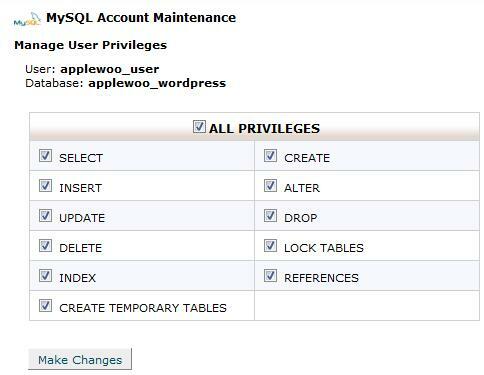 There may be a prefix present on your Database and user name e.g “applewoo_wordpress”, “applewoo_user”, this is to ensure that no name conflicting occurs on a shared hosting. Rename the “wp-config-sample.php” file to “wp-config.php”. 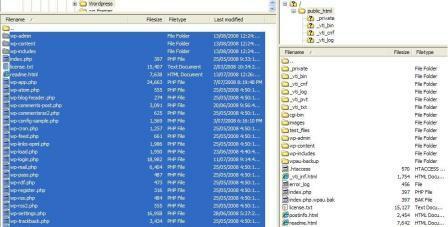 Upload this updated “wp-config.php” file to the root directory (‘public_html’) of your web server or to the sub directory if you are installing WordPress in a sub directory of your site. Run the WordPress Installation script by visiting the ‘wp-admin/install.php’ link of your site. Basically enter “http://www.your-site.com/wp-admin/install.php” in the address bar of your web browser and follow the one click installation process. WordPress should now be installed and ready to go. 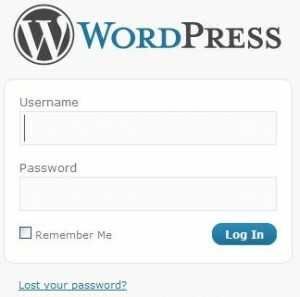 Log in to your WordPress admin section by visiting the ‘wp-admin’ link of your site using the user name and password sent to your inbox. The total WordPress install time will vary depending on your internet connection speed but below is a graph showing the average install time for my WordPress Install. The WordPress installation is fairly straight forward but If you are having problem then have a look at the detailed installation guide on WordPress.org as stated earlier or leave a comment below and I will try to answer if it’s within my capability. This entry was posted in Uncategorized and tagged free ftp software, how to install wordpress blog, how to install wordpress on your blog, web hosting solution, wordpress blog. Bookmark the permalink.